Good morning sweet friends, I hope you’ve had a wonderful week!! I’m tickled to say that the Creative Team and I have a special blog hop next week on Tuesday, June 13th to introduce a new line of dies. It’s hard to see all the possibilities by just looking at a die so we’ll be sneak peeking samples of what can be made with the dies! There will be prizes so as you go along the hop, you’ll want to stop at every stop to have the opportunity to win :-) In the meantime today is Day of Giving Friday where I’m sending this card off to one of my readers (including international) who comments. I’m sharing something I had not shared here before and I hope you’ll enjoy the steps out that show how to make it. I don’t know why, but I have baskets *full* of washi tape. I don’t use them often but jump when I find a nice way to include them with cards. In that endeavor I used the Graceful Frame Maker Tool to create an overlay or frame to put on a card. So many of the washi tapes are beautiful and I hope to use more of them in this way. 1. 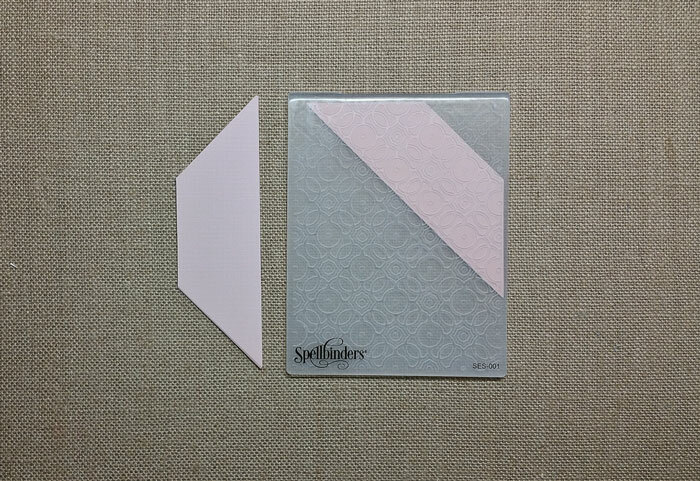 Start out with a 6-1/2″ cream card base and layer with a 6-1/4″ gold matting layer and 6″ cream layer. 2. 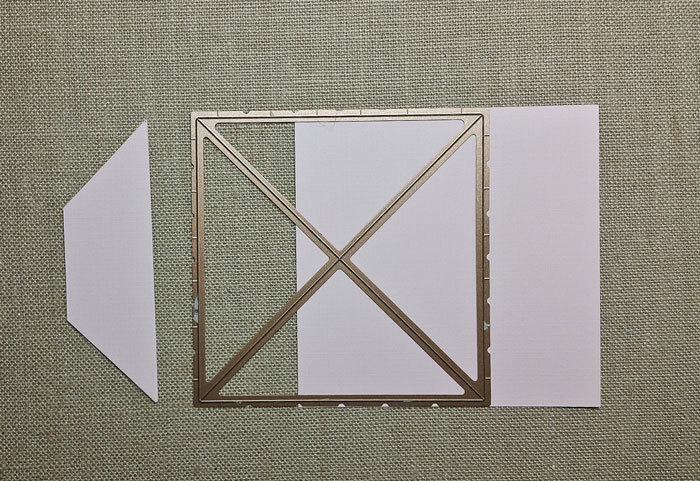 Cut a 6″ square piece of card stock with the S6-112 Graceful 6 x 6 Frame Maker giving you 4 triangles. Together, cut the tip of the group of triangles off so that you are left with 1-3/4″ depth (the piece shown on the left, above). 7. 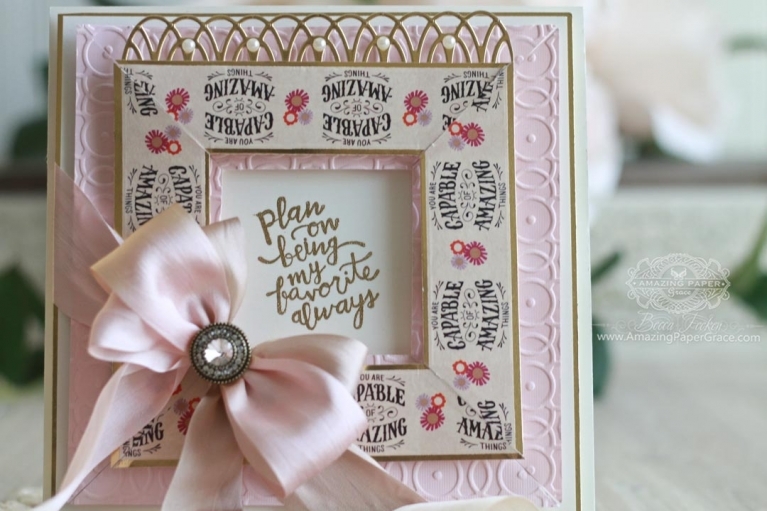 Add a header to the frame by trimming a length of the Arched Border from S4-704 Graceful Sweet Words Border Set. Finish with pearls, ribbon and a bow. For new readers, every Friday it’s my pleasure to give away a card. The card goes to a randomly picked reader (worldwide) who leaves a comment in our conversation. Want to know more about Day of Giving, here’s a link to my FAQ’s just check out #11. You can check the list of winners HERE! By the way, I loved reading what everyone collects last week!! For your comment: Do you make craft alone? How likely are you to encourage someone to pick up your favorite craft? 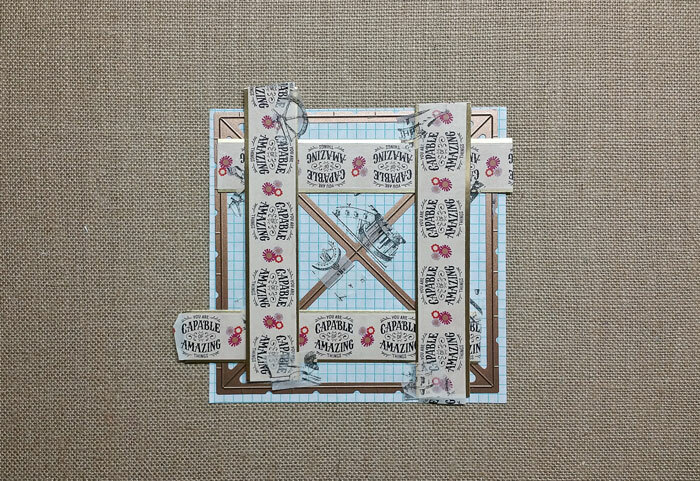 I just loved the “You can do amazing things” washi tape and seem drawn to tapes that have sentiments on them. This not a difficult technique an I hope you’ll give it a try some time :-) Thanks so much for popping in!! Remember, introductions and giveaways on June 13th. This is such a beautiful card Becca, and really beautiful made. I´m the same have lots of washitape lying around, but hardly ever use it, to be honest, but it really looks great the way you´ve used it here, so maybe I should drag it out again and try to get some of it used here he he. I generally craft alone, but do run a monthly class in which I encourage others. Beautiful card, as always, Becca. When I’m making cards to send, I craft alone but I have been teaching craft on cruise ships for 12 years and through that encourage others. There have been lots of ladies who have never done any sort of craft before who get the bug after coming to my classes and many have stayed in touch with me. Quite a few tell me that I am responsible for a diminishing bank balance because of all the tools and materials they go out and buy!! Love this card and remember when you introduced the die almost a year ago now. I of course purchased and have to admit that I usually only craft once a week and have not as yet used it. Going to real soon, maybe hubbies birthday card! I craft with a group once a week and encourage all of these ladies to use my dies in their cards. We have added a few more people and sometimes when we give our cards, have people who want to learn to make cards so we promote it every chance we get. Look forward to the blog hop on the 13th. Thanks for the tutorial! I’m not a huge fan of washi tape because it doesn’t seem to stick very well to the project. So I use it to temporarily adhere projects to the various Big Shot plates. However, I will give this a try and see where I end up! But I love the end result of your project. The pink layers are so pretty! What a great way to use Washi tape! I love it but find myself at a loss as to where/when to use it. 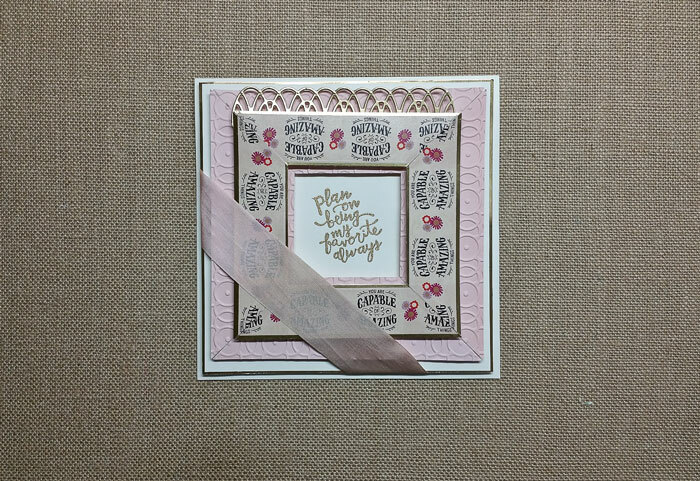 I’m loving my frame maker and the card this week is perfect. I’m loving too the Sweet Words Borders too. 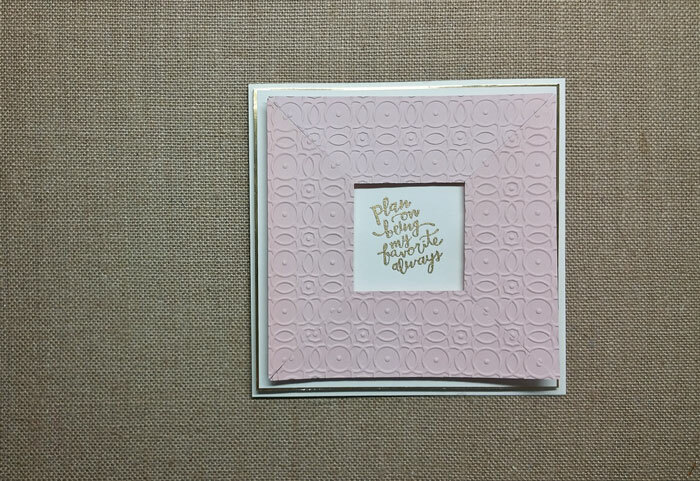 Hi Clever Lady….lovely card Becca! God has certainly blessed you with an wonderful talent!!!! I mostly craft alone, but do belong to 3 card clubs so interact with these ladies. Also did teach classes before being Jim’s care giver…now that I have downsized and in a one bedroom apartment with my Studio set up along a 14′ wall – and, 3 closets full of organized supplies, I am ready to begin crafting again. Truly think still I have enough supplies to last me the rest of my life – even after the downsizing – LOL! I usually craft alone, but I do get together once a month with a couple of gals and we make cards. I enjoy that. Such a gorgeous card! Thank you so much for sharing how you made it! I mostly craft alone, though my hubby helps me at times. 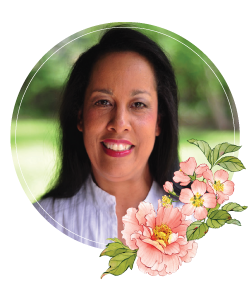 When my grandchildren are here, we always do some type of crafting…depending on which ones are here, as I have four grandchildren different ages. A friend’s daughter came to craft with me one day and is planning on coming back. I always encourage anyone at any age to pick up a craft and for sure enjoy teaching others what I have learned myself. This is stunning and your step by step instructions are great, thank you. I have encouraged countless children to craft, neighbours’ children and school children when I volunteer at my granddaughter’s school. It is so rewarding, I was even told I was “awesome” by one particularly difficult boy!!! 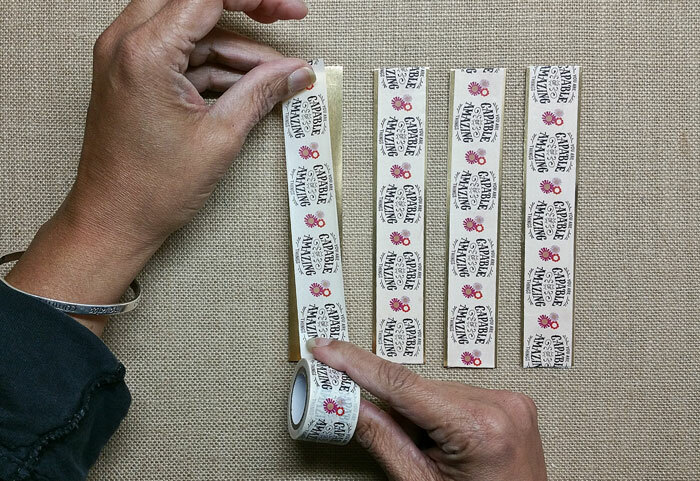 It sounds like you’re definitely not alone in the washi tape department. Thanks for inspiring us to get it out and use it! For me, creating/crafting is primarily a solitary activity. In August, however, I am visiting my twin sister and we plan lots of time in her fabulous crafting room sharing a bunch of the ‘fun fold techniques’ that have captured my imagination. Can’t wait! I’m excited about your blog hop next week, also. 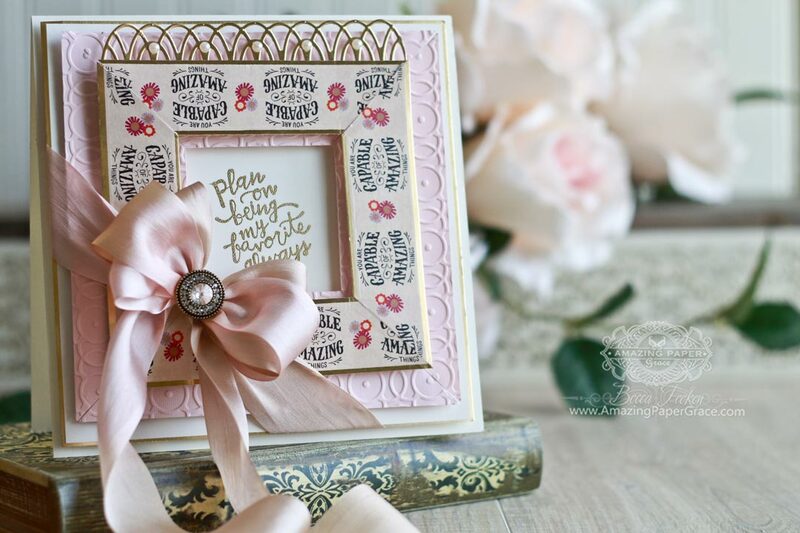 The Amazing Paper Grace Design Team is inspired, for sure! Hi Bacca, this is lovely! I need to pull this die out & give it a try. I craft alone as I am time restricted, but my daughter does like to join me sometimes. I have rubbed off a little on her with the craft bug. I only do paper crafts, but am happy to see that she is interested in sewing as well. She has now started taking classes which comes to a surprise to a lot of people, as she is only 10. I am happy she has taken it up, as I was terrible at it lol & never gave it a chance, probably because I did not enjoy it. I winge about mending a button haha except if its for crafts lol I llok forward to your hop next week. Ooh I can’t wait for the new line! Supercute card thanksfor sharing. I’m also guilty of storing and never using my washi tapes so great to have inspiration to try something new. What a beautiful inspiring card! Unbelievable card and techniques used to make this gorgeous card. I recently retired, now have time to pursue card crafts! Love to work alone and with friends. We challenge each other monthly to a theme card, great fun! Love the use of color on this one as ordinary white and gold would not carry the sentiment as well. What a beautiful card! What a creative use of the Washington Tape. Thank you for inspiring me to use this collection that I bought when you debuted it across the pond. I work at home, so my computer is on one wall, my card making on another. I craft alone most of the time. I do have a crafting buddy I visit occasionally and I take card classes at our card store. Thank you for inspiring me to use your dies, especially this set. Hi Becca, This card is beautiful, I absolutely love this washi tape. This card is soooo sweet! Really pretty! I usually craft alone but run a weekly class at Church to encourage others to have a go! Our 3 eldest members are 95, almost 95 and 91 and they love their afternoon out – tea, coffee, biscuits, friendship, fellowship and fun – and cakes when it’s someone’s birthday and ice creams on hot days! A couple of the Mums sometimes bring their children, so we encompass all ages. It is pure delight seeing the pleasure that comes from completing a card or project – and such a blessing!